Dr. Cecil Yeung is a Houston’s best facial plastic surgeon offering facial dermal fillers. He is known for his personalized and attentive approach and for delivering the most natural-looking results for his patients. Dermal fillers are an effective and proven way to treat facial wrinkles and restore a youthful appearance in your face. When you see famous celebrities, models, and women over the age of 45 with facial skin that looks smooth and young, in most cases the reason is that they have had dermal filler injections. We all have special occasions that make us want to look our very best. In some cases, you want a quick and easy treatment that doesn’t need to last a long time. If you are tired of wasting money on wrinkle creams that don’t show any measurable results, it may be time to consider dermal fillers. How do cosmetic dermal fillers work? A consultation with expert cosmetic surgeon Dr. Cecil Yeung is the first step to determining the best treatment option for your needs and your desired look. In many cases, patients may consider dermal fillers as a way to achieve facial rejuvenation without undergoing a plastic surgery procedure, such as a facelift. What dermal fillers are used? Although there are quite a few dermal fillers on the market, Dr. Yeung has carefully selected those that he feels are the best for his patients. After a consultation, Dr. Yeung will recommend one that he believes will best suit your needs. Each is made with a different substance and has slightly different uses. Juvederm®: Juvederm Ultra is used to plump fine surface lines and Juvederm Ultra Plus can be used for deeper and more depressed folds of skin. Radiesse®: Radiesse is a semi-permanent filler used for deeper wrinkles, which can last a year or longer. Restylane®/Perlane®: Both of these cosmetic dermal fillers can help visibly reduce moderate facial wrinkles and folds or add fullness to lips. Each treatment can last from 6-12 months. 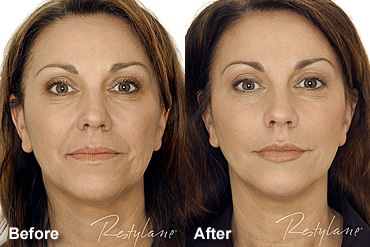 Perlane is a treatment option within the Restylane family of products that are typically used for deeper wrinkles. The results from dermal fillers can last anywhere from three months to two years and even longer, depending on what type of filler is used, how you care for your skin, and how your face continues to age. Where can I find the best doctor for dermal fillers in Houston? If you are looking to achieve a more youthful, wrinkle-free appearance, contact our Houston office today to learn more about our dermal filler options. You can also get started by filling out the appointment request form right on this page.